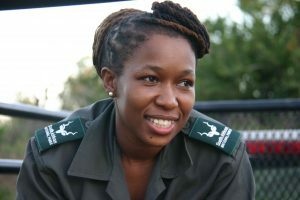 Zoe Nhleko is an SNRE PhD student, McCleery lab, researching white rhinos in South Africa. How did you become interested in wildlife? What’s your origin story? I was part of an environmental group when I was in primary school. One afternoon a week, we would go to a local museum to learn about the environment. One day we learned about extinction. They were showing us the dodo, and told us it was extinct. They told me that there were no more, that we finished them, and that other species were going extinct now. I’m looking at the spatial distribution of white rhinos in the Kruger National Park. We are want to identify the important environmental features that make habitats suitable for white rhinos for management purposes. 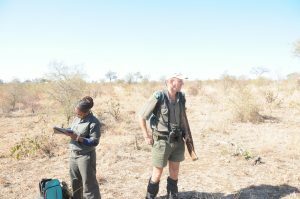 With the high poaching rates currently taking place in Kruger we may need to conduct internal translocations..
Internal translocations can only be successful if you move rhinos to the most suitable environment. If you move them to unsuitable habitats, they move back to where you found them. We are also studying ways in which we manage the species so that, even though poaching is happening, they are reproducing at high enough rates to withstand it. A Trimble Juno handheld GPS. You can load it with software called cyber-tracker. It’s a game changer. I literally walk into the field with this handheld GPS, record all of the data that I am collecting, instead of using data sheets, which I hate, because they get lost and rained on! When I return to the office, I just plug it into a computer, and my data is already safe in a database. It’s perfect! What’s your favorite animal you’ve worked with? I studied them for my masters. 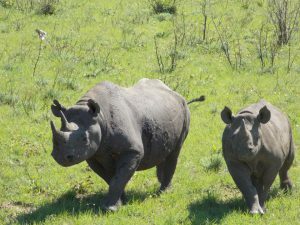 They are so interesting; they are related to white rhinos but are so different! Black rhinos are territorial. When you are in their space, they decide if they are going in for an attack, or if they are going to run away. White rhinos are more docile. They can sense that you are there, but they don’t really do anything about it. Did you have any close encounters with black rhinos while you were researching them? 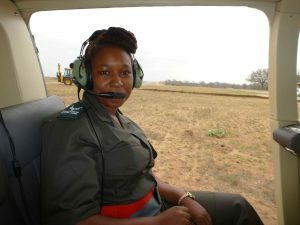 The first week I started my fieldwork, I got chased by a black rhino. The game guard who was with me had said “never run” unless he said so. The whole week, he did not say “run”. Normally, when you are researching black rhinos, you climb a tree, so you can survey them safely. This time, there was no tree. There was a little standing water between me and the rhino, so I was a good distance away, I thought. I was taking pictures, and then I’d look down to see if I’d gotten the ear notches. The next time I looked at the camera to take another picture, the rhino was just a bit closer than it had been. The game guard was quiet, assessing the situation. Then I looked up again, and the rhino was actually running, but I couldn’t see its feet. It was coming at a fast gait towards me. He wanted me to run far enough to create such a gap between me and the animal that if he needed to shoot at it, he could without shooting me. I guess I had run far enough for him, because he said to stop. I was like, “Oh…ok,” and I stopped. The rhino slipped and fell, and for a moment I panicked, thinking he’d shot it. But then it got up and ran off! We found out later that it was and old, old animal, and basically both blind and deaf. That’s why it took three warning shots for it to realize that something was happening and maybe it should get out. That’s wild! It must have been pretty scary! Because of the ear notches, we can tell who’s who, and that rhino chased us three more times after that! I try to plan ahead, because I don’t like to do things last minute. I’m one of those people that finds working at the last minute overwhelming. Even if the deadline is two weeks away, I try to do a little bit every day so that by the time the deadline comes, I’m just putting stuff together and it’s fun. Do you spend long, continuous periods of time in the field? I’ll usually do two weeks of continuous fieldwork, then I’m inside for the next month. It’s a good balance, because if I feel like I’ve been in the field for a while, I can look at the number of days remaining and know that it’s actually not that bad. That seems to work, and one thing that I find helps is to have a daily exercise routine. It doesn’t matter if I’m in the field, starting the day by working out makes me feel in control. I still got to do something I wanted to do. I like that it’s small enough so that it’s not overwhelming, and that there are not too many things to do, which can be distracting. I can’t imagine going to school in New York, there are too many things happening! There’s enough happening here that you have things to do if you’re feeling social, but I don’t feel like I’m missing out when I have a lot of work. Haley Epperly! 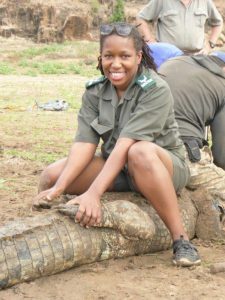 She’s been working in southern Africa for two seasons now. It’ll be nice to learn how she’s finding being in the field in another country. Obviously, as a conservationist, I wanted to say that they just are! But I needed a more complete answer, so I thought about how we can make rhinos more important to people, even if not for conservation reasons. Why would a rhino be important to anyone? I thought about sustainability, and the three ideas that any decision or action should be good for the environment, society, and the economy. One of the arguments is that, maybe, we should be trading in rhino horns. Maybe trade isn’t a bad thing. We could introduce trade on a wildlife product, so people would start valuing them more, and the by-product would be conserving them. For example, with naturally dying rhinos, you have to take their horn and put it away. If you can allow private farmers to sell those horns, there would be more incentive to conserve the rhinos, because at the end of the day, what do you want? More rhinos! However we make more rhinos, as long as it’s legal, we get more rhinos! I want people to know that not all change is bad. It could be good for the economy of any country that has rhinos! Why do you think people don’t want to trade farmed rhino horn? I think the problem is the way it’s been framed. People always talk about “flushing out the black market”, but how do you flush a market when you don’t know what the demand is? We might actually be creating more problems by saying we want to open trade, because there are a lot of things we need to work out before we go ahead with it. Because of these problems, there hasn’t been a lot of studies done to get the information we need to make the decision on whether to trade or not. Most ecologists are automatically opposed to trade, but I don’t think it’s that simple, because you should be willing to investigate actions before you just say no. I know why people are uncomfortable with the idea, because governments can be corrupt. And I realize that the problem with conservation right now, especially in Africa, is that it is seen as something for elite people. The people in villages and the poor don’t see why it’s important for them. Conservation doesn’t benefit rural areas right now, most of the time. If anything, they have to deal with big animals, like elephants, getting into their crops. 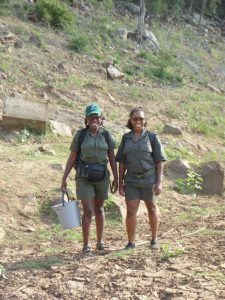 If we were to incentivize having rhinos and rhino farms, private management, maybe people could come together into community-based natural resource management groups, and they could actually farm rhinos themselves. This would create wealth, and also, ecologically, rhinos are good for the systems live in, because they increase the diversity of plants and animals that can live in those habitats. So now you’ve checked two boxes. Economically, the rhinos would be making money for people. 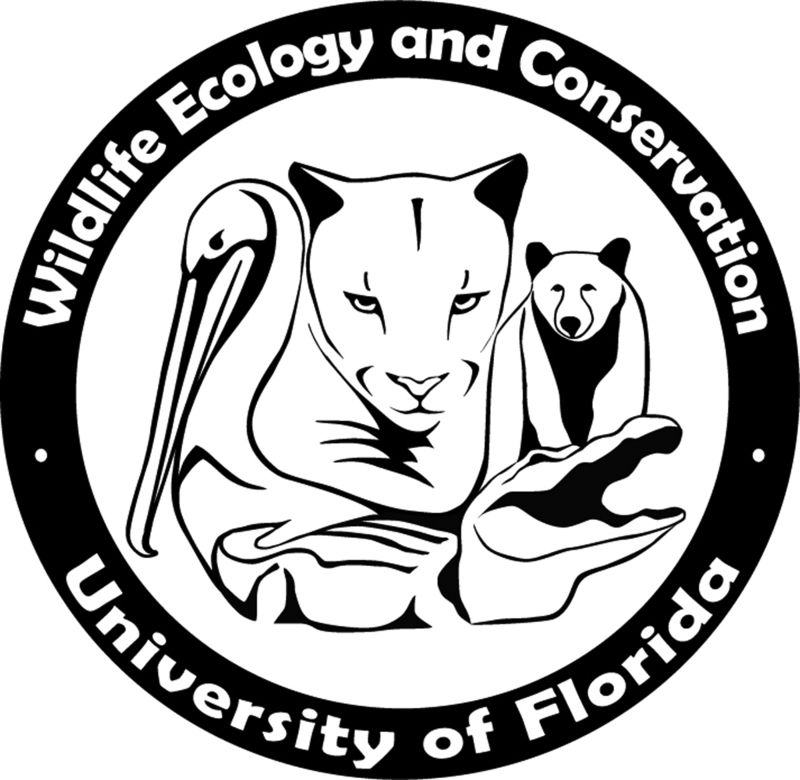 Ecologically, they are changing the system so that more species can co-exist here. That means that economically you are helping the society, and healthy ecosystems are also good for the community and human wellbeing. You may potentially solve the issue of rhino conservation by showing people how important they are in other areas. I think that’s probably a good way to start. Right now, I know we’re not ready. There are some things that are just not in place. But we need to have these conversations to say. Right now, if you bring up trade, people just shut down. But it’s important, because if we have these conversations, we might actually find a solution which will result in more rhinos! This interview by Rhett Barker, and has been lightly edited for clarity by Claire Williams and Rhett Barker. Thanks to Zoe Nhleko for speaking with us!